Sarah Calhoun is the fifteen-year-old daughter of the Elector Andrew Calhoun, one of Appalachee’s military heroes and one of the electors who gets to decide who will next ascend as the Emperor of the New World. None of that matters to Sarah. She has a natural talent for hexing and one bad eye, and all she wants is to be left alone-especially by outsiders. But Sarah’s world gets turned on its head at the Nashville Tobacco Fair when a Yankee wizard-priest tries to kidnap her. Sarah fights back with the aid of a mysterious monk named Thalanes, who is one of the not-quite-human Firstborn, the Moundbuilders of the Ohio. It is Thalanes who reveals to Sarah a secret heritage she never dreamed could be hers. Now on a desperate quest with Thalanes to claim this heritage, she is hunted by the Emperor’s bodyguard of elite dragoons, as well as by darker things-shapeshifting Mockers and undead Lazars, and behind them a power more sinister still. If Sarah cannot claim her heritage, it may mean the end to her, her family-and to the world where she is just beginning to find her place. D.J. (“Dave”) Butler grew up in swamps, deserts and mountains. After messing around for years with the practice of law, he finally got serious and turned to his lifelong passion of storytelling. He now writes adventure stories for readers of all ages, plays guitar, and spends as much time as he can with his family. 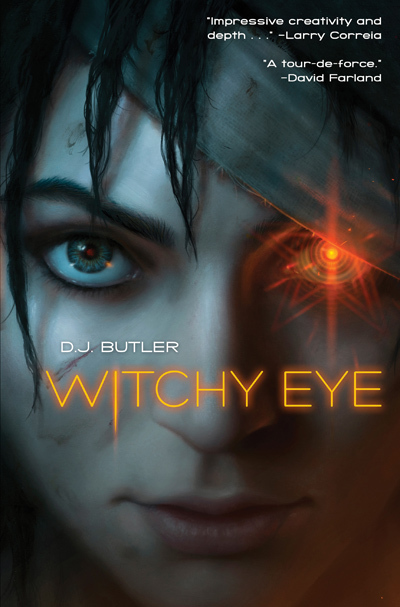 He is the author of City of the Saints, Rock Band Fights Evil, Space Eldritch, and Crecheling from Wordfire Press, and Witchy Eye from Baen Books.